More and more riders are taking the express bus service between Clarksville and Nashville, but they’d rather be on the train. The move to commuter rail would help unburden a congested I-24 and quell the clamor for fast, reliable service for those who want to work or play in Nashville. RTA’s Route 94X Clarksville Express buses are carrying an average of 5,160 riders a month in fiscal year 2015, according to numbers from RTA. Officials expect ridership numbers to grow significantly, and backing that up are U.S. Census numbers that show the Clarksville Metropolitan Statistical Area (MSA) is the second-fastest growing MSA in the nation. The RTA has released some initial results from its Northwest Corridor Study, which is gathering transit preferences from residents and other stakeholders. A majority of respondents say they want rail. The $1.2 million comprehensive corridor study will build upon findings and recommendations from an earlier study and explore all avenues to improve the Clarksville-to-Nashville commute. 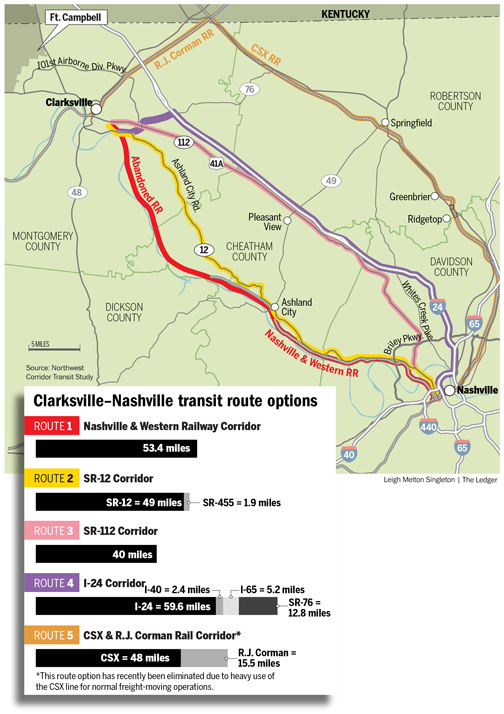 A 2009 feasibility study done by Nashville-based CSR Engineering on commuter rail options between Clarksville and Nashville shows the firm chose the Nashville & Western Railroad as the most reasonable alignment. The study stated that the line could be completed in five to eight years at an estimated cost of $144 million with yearly operating costs of roughly $5 million. “With the Northwest Corridor Study we’ve been through a couple of rounds of meetings, says Felix Castrodad, director of planning for the RTA. “I think what we heard from most of the people is that they want simplicity, something that is dependable and permanent. They also want something that is competitive with the car as far as travel time,” he adds. Clarksvillians have been hearing about a possible rail route for sometime and are curious, even ones that already have a transportation plan. Linda Deason, a state administrative services assistant with the Office of Business & Finance and Administration, lives in Clarkesville but takes a Regional Transit Authority commuter van in with other Montgomery County residents every day to work in Nashville. RTA runs the Express Bus program but also a van program in alignment with the state for its employees. Deason says her van-share group had been hearing about a train for some time and are again getting excited about the possibility given the new Northwest Corridor Study. She says a train would be an “interesting” choice but taking it would depend on a few factors. 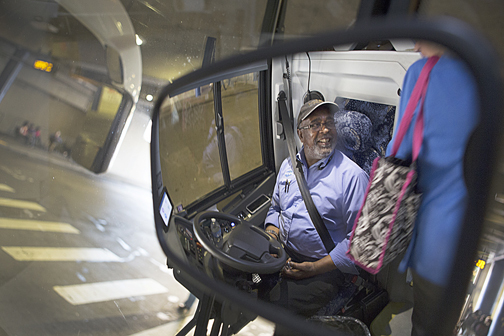 Reflected in his bus mirror Gray Line bus drive Charles Branch greets his passengers as they board the bus headed home to Clarksville from downtown Nashville. Branch has been driving this route for three years. Highway 41-A that runs adjacent to I-24. CSX Rail east of I-24 (The bustling CSX freight line was nixed because that is too busy with freight to forfeit rail time for commuters. The other four corridors are still in play). “Part of this has to do with whether or not we are going to be able to go after federal funding,’’ Castrodad explains. “One thing that they’re going to ask us is whether we looked at all the alternatives. So, they want to make sure that all of the possibilities have been studied,” he adds. 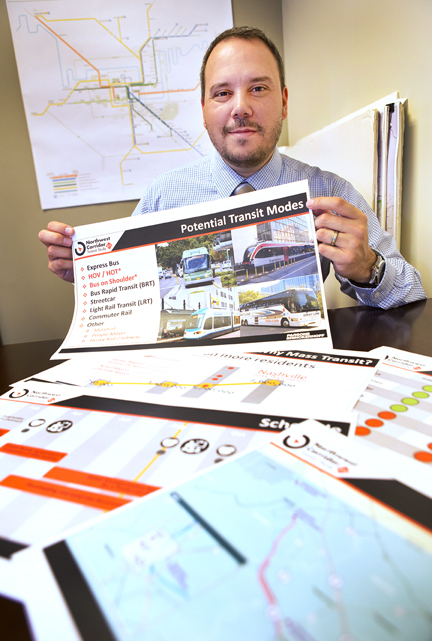 Felix Castrodad, director of planning and grants, displays charts and graphs from a corridor study on transit investments. He also said the study on the Northwest Corridor was “not a commuter rail study” but a look at all the options. The push for rail has been going on for more than seven years. In 2009, a bill was passed in the state legislature allowing local governments to set up dedicated funding sources for public transit projects and give regional transportation authorities the power to borrow money by issuing bonds. Currently, the over-the-road bus coaches are operated by Gray Line, under contract to the RTA and can seat about 56 people. More than 5,000 ride the buses on average per month. The route from Clarksville to Nashville operates three trips in the morning and one from Nashville to Clarksville, while in the evening hours; buses make three trips from Nashville to Clarksville and one from Clarksville to Nashville. Ashland City Highway and Highway 41-A could be utilized in a variety of ways to include Express Bus service and/or Bus Rapid Transit (BRT), the study shows. As well, adding more Express Buses to the I-24 run, adding an express lane to I-24 for car commuters and buses on shoulders along I-24 are also possibilities. “We are also looking forward to more in-depth analysis on express buses, and also to hear from stakeholders asking us to look at high-occupancy toll lanes,” Castrodad says. The Nashville and Western Railroad’s section of track from Ashland City to Clarksville has reverted to a walking trail but could be rebuilt because the roadbed from Ashland City to Clarksville is still largely in place. The feasibility study said the line would be 43 miles long with a travel time of 48 to 55 minutes. The railroad is owned by the Cheatham Rail Authority and is operated by Nashville & Western Railroad (NWR). It carries freight such as scrap metal to the industrial park just south of Ashland city. The NWR is a subsidiary of the Nashville & Eastern Railroad, which operates the Music City Star. 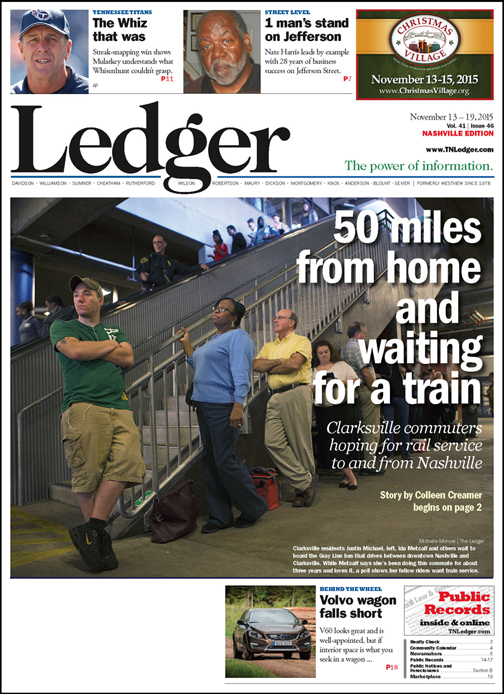 The only other commuter rail in the region, it runs between Lebanon and Nashville. Castrodad says that with any long-range transportation solution getting people to a final leg of their trip was important. “They also want what we call a reasonable “last mile” of the destination, some kind of solution to winding up their trip, whether it’s walking or getting on another bus,” he says. The Nashville & Western rail line now stops near the Farmer’s Market in Downtown Nashville. The Northwest Corridor Study is just one part of nMotion 2015, the MTA/RTA’s Strategic Plan, a 25-year comprehensive plan built to meet the region’s vision for transit. The plan is expected to enhance the transit system and attract new riders. In the 2035 Regional Transportation Plan adopted by the Nashville Area Metropolitan Planning Organization, the plan calls for the development of a new commuter rail line in the region’s northwest corridor to connect Clarksville and Nashville. The Nashville Area MPO is the federally-designated transportation agency responsible for identifying transit needs in the region. Michael Skipper, executive director of the Nashville MPO, said the Northwest Corridor Study was needed to get federal monies for commuter rail. “That corridor specifically was identified as a commuter rail corridor in the 2035 Plan,’’ he says. Skipper said the grant the MPO would apply for is competitive, and therefore, the agencies involved needed to show both need and capacity. “If you want the competitive money that is earmarked in Washington for these types of projects then you have to demonstrate that it’s a good investment,” Skipper adds. “Even if the feds didn’t require us to do this, it’s the right thing to do anyway. People get worn out by studies, but any time you make a major public investment, you want to make sure you have looked at the cost benefit.